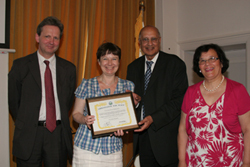 Nicolette de Burford was presented with an Ambassador for Peace award by Lord King, Margaret Ali and Robin Marsh. Nicolette is passionate about interfaith and environment issues. 'It was a lovely surprise and honour to be made an Ambassador for Peace! With the love of God, I will always strive to be this. I must say that I love coming to your events and meeting the people that attend them. I have made some very positive contacts and I believe that some wonderful joint good work will come from them.